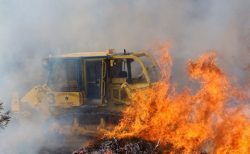 For many years, firefighting dozers have been open cab machines. With the advent of heavy-duty HVAC systems and the ability to build integrated sealed cab environments, enclosed cabs on Fire Dozers have become a reality. Fire Dozers get into some pretty hellacious situations. Heavy dirt, falling limbs, ash, soot, burning sap, swirling sand etc. are all part a typical day. Firefighters who are counting on the dozer to move combustible debris, clear fire lines or cut an exit path, don’t have time for failures. Fire Dozers are specially equipped to survive in the toughest conditions. Metal cages and guards protect the most sensitive areas of the Dozer and there is little tolerance for anything that can be scraped off by a falling limb or impede the Dozer’s ability to do its job. Firefighters’ lives are at stake when the dozer is in the field. The HVAC systems on dozers are, by definition, heavy duty, as high heat, strong winds and furnace-like conditions make it difficult to breathe and difficult to cool the air. Even in the friendliest environments, they contend with large amounts of airborne contaminants which plug the evaporator coils and cause HVAC failures. Over the years attempts have been made to improve the fresh air intake filtration to take out as much of the contamination as possible before the air passes over the evaporator coils. The solution to the problem is found in Sy-Klone’s RESPA-CF2. It performs the first and most critical function–it precleans the air before the air gets to the filter media. Between 90 and 97% of the debris is ejected from the powered precleaner prior to the air passing into the filter housing. The fact that only the smallest particles pass through the powered precleaner onto the filter allows the filter to evenly load with fine particulate. Hence, the combination of precleaned air flowing through a HEPA filter keeps the evaporator coils clean and produces the best possible environment for the efficient operation of the HVAC and the best cab conditions for the operator. 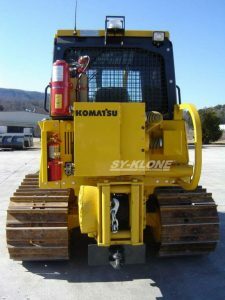 Call Sy-Klone today and learn about the filtration options available to keep your team safe in or out of the fire!